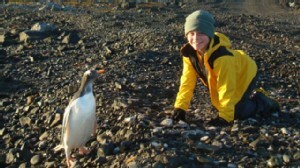 A few days ago, Nikolas completed his second marathon – in Antarctica. The weather got pretty nasty during the run, and race organizers were forced to bundle everyone onto an airplane, and fly them back to Chile. Nikolas ran the final 8 miles of his marathon there. So why is Nikolas doing all this running? To raise money for Operation Warm, a not-for-profit organization his grandfather founded. The charity buys warm clothing for kids in need. Nikolas isn’t sure when and where his next marathon will be. You can follow his adventures here. Heroes are everywhere – in comic books, movies, and of course MY UPCOMING NOVEL! But real-life superheroes pop up in some pretty surprising places. Like the running track, or even the basketball court. So often these days, sports stories have to do with money, or winning-at-all-costs, or banned substances (yeah, I’m looking at YOU, Lance Armstrong). It doesn’t take much to be heroic. You don’t need X-ray vision, or six-pack abs. All you need is a little kindness. 7 year-old Jack Hoffman has had some bad luck lately. Two years ago, he suffered a seizure, and nearly died of respiratory failure. Then he was diagnosed with cancer. And then he had two brain tumor surgeries. But Jack has had some good luck too. Between operations, he met his hero Rex Burkhead – a running back for the University of Nebraska football team, the Cornhuskers. Jack took to the field in full gear, and ran a heroic 69 yards for the game’s final touchdown. The crowd of 60,000 went nuts. More on Jack’s heroism here.